Basically MSPE uses T&T melee rules where each side generates a combat total. 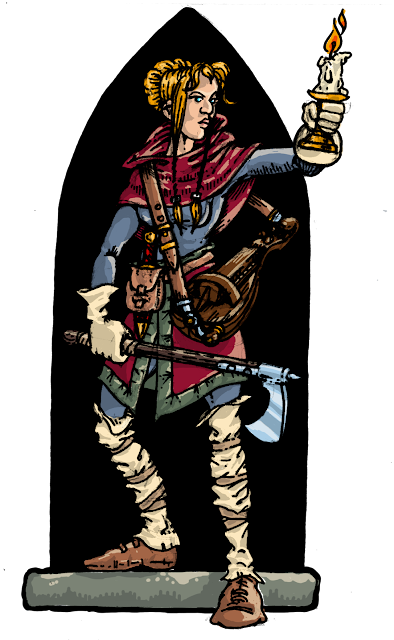 The heart of the system is the SR system for imaginative players and DM. 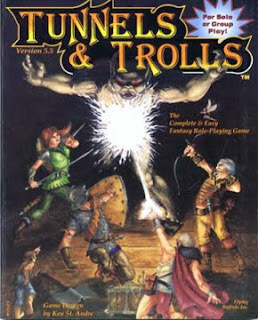 It needs a good DM with reasonable view of combat if the game is not to becomes a caricatural uber hollywoodian zany fest, but, when done right, it gives a very imaginative and open system. Whilst this system is very efficient to resolve multi combattants fights in fantasy or pulpish situations, it is not what I use for whodunnits or high danger fights. Indeed T&T fights tend to be long and attritional which is not what is needed, I think, when we are speaking about murders, or violent and quick confrontations. Whilst using T&T style would work, specially if SR system is used well, I do still find it unsatisfactory because, it won't give the right kind of blow by blow feeling. The first idea I had came from an interview from Ken in White Dwarf 32 where he suggested for peoples willing to have bow by blow fights to make SR (well, he was speaking about percentage, but you got my meaning) and apply damage from the success of the blow. I thought about using gladiatorial rules published in Sorceror's Apprentice. But, whilst interesting for what they wanted to model, they were still not what I wanted. So, I made my own, (very) broadly based on Harnmaster use of a result chart. I used it a few times (because, I insist, not all settings or situations need this kind of treatment) and I must say that it really shined, particularly in a medieval whodunnit we played last year. 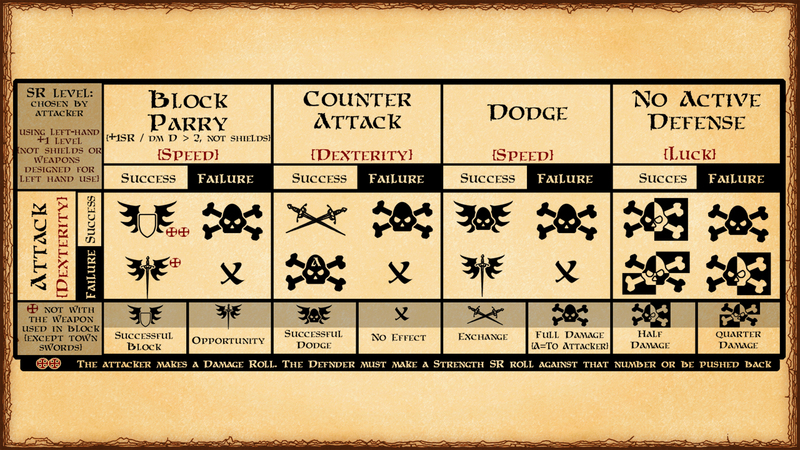 The system is quite easy to use, the aim being to have a more descriptive or flavorful fight (more quickly lethal also), not to unduly complicate the game. The system is based on the following table and on SR rolls. 2- The attacker decides the base level of the SR he is going to take (representingthe difficulty of the maneuver he is attempting). 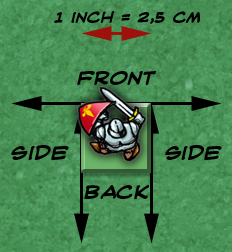 3- The defender chooses one of the different defences: (Parry/Block, Counterattack, Dodge, No Active Defense). During the same turn, he is only allowed to use each choice (attack included) only once; meaning that multiple attacks from different attackers can leave him without defense at all and that a character can initiate attack only once. 4- Both attacker and defender make a SR roll (the base level is the same for both, but it can be modified(see later)), based on the characteristic associated with the maneuver (see table) plus Skill Level if any. 5- The GM the looks at the table, depending of the success/failure of both participants to determine the results. Attack can only be attempted when it is a character turn to act and only if he didn't move more than half his move allowance. The defense actions can only be used against melee attack, except for the DODGE which can be used against a thrown weapon, but only if the thrower is within the field of view of the target. - if using the left hand (to attack, parry, block…), the character adds one level at his SR, for the added difficulty. This does not apply if the object has been designed for that use (a shield to block, a Main-Gauche to parry..). Successful Block: the attack was stopped; the attacker must still roll a damage roll and the defender must make a Strength SR roll against that number or be pushed back. Opportunity: the attacker has opened himself to an opportunity counterblow, the defender can make one attack (which the attacker can defend against normally); he can not used the weapon that was just used to parry (except if it was a town sword, which could lead to an exchange of blows and counterblows). That opportunity attack does not count as a normal attack, which means that the character doing it can still attack in his turn. 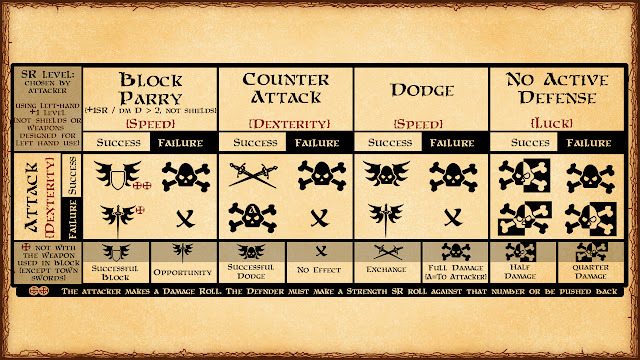 Full Damage: the defender take the full damage roll of the attacker (except for the skull with a A, where it is the attacker that takes the full damage from the defender). I wouldn't certainly advise to use it in every circumstances, it is certainly not needed as the normal rules work very well in most situations. 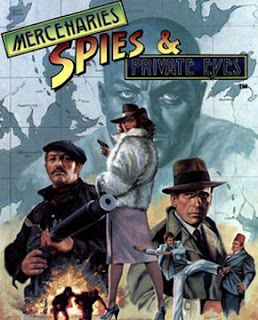 Settings that would benefit, are historical whodunnits and settings where swashbuckling would add to the setting atmosphere (three musketeers, prisoner of zenda, but also if you add laser sabre style fights to your pulp sf). Let me know if you use it. And in that case, let me know if you like it. And YES! MSPE is going to be re-edited as a kickstarter! And not only that, but it is a real re-edition. not a new game under the same name. The original rules are respected not changed. There is going to be some added material (notably to play in futuristic settings - Blade Runner, here we come! ), but in new chapters, expanding the original (which is fine), not mutilating it. Don't miss this Kickstarter of one of the best roleplaying game of all times. If MSPE gets some new life from this re-edition, I am very tempted to post some of the stuff I am using for my games (rules addons for specific settings or situations, cardboard figures and terrain, VTT tokens and battlemaps, scenario ideas, NPC generator program,...). We'll see how it turns out.